My country is at a crossroads. If it does not reform its governance system to better protect against corruption, it will become mired in crony capitalism. 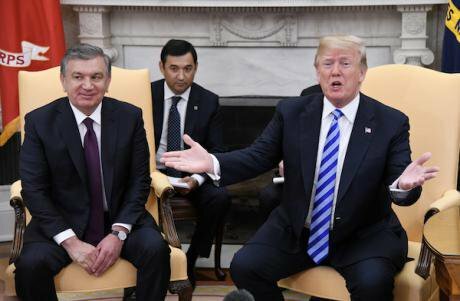 17 May 2018: President of Uzbekistan Shavkat Mirziyoyev visits the White House. Photo: Sipa USA/SIPA USA/PA Images. All rights reserved.President Trump’s meeting with Uzbekistan’s President Shavkat Mirziyoev brought a sudden end to the country’s international isolation this month, opening the door to new investment opportunities and the possibility of a renewed strategic military partnership, vital to the American war effort in Afghanistan. Since inheriting power from his deceased predecessor, the dictator Islam Karimov, then winning a dubious election in September 2016, the new Uzbek leader has made it his mission to thaw relations with his central Asian neighbours and take the country back onto the international stage. Mirziyoev has also taken some steps toward addressing the country’s egregious human rights violations and making the country easier to do business in. The changes are largely superficial, however, and the US will need to push hard for structural reform if international businesses and their staff are to enjoy a safe operating environment in Uzbekistan. The Trump White House should push for that reform sooner rather than later, if it wants to avoid an embarrassing repeat of President George W. Bush’s acrimonious split with Uzbekistan more than a decade ago. In the aftermath of 9/11, the Bush administration was so eager for Central Asian bases to support its war in Afghanistan that it agreed a strategic military partnership with Uzbekistan, despite the brutal and repressive nature of the Karimov regime. That eagerness was short-sighted; when Karimov overstepped by ordering his security forces to shoot dead hundreds of protesters at Andijan in May 2005, Washington was left with little choice but to join international condemnation of the slaughter. The dictator struck back, shutting down the US airbase at Karshi-Khanabad, opened just three years earlier. Karimov was never invited on an official visit to the US or any major European capital again. Mirziyoev wants to avoid that kind of infamy. He is clearly keen to improve Uzbekistan’s image as one of the most repressive countries in the world. His government has recently allowed visits by Human Rights Watch and Amnesty International, released prisoners of conscience, and begun a dialogue with the Cotton Campaign, an international movement including Uzbek exiles like myself, which seeks to end the yearly practice of forcing Uzbeks to pick cotton for little or no pay. On the eve of Mirziyoev’s travel to the US, defendants accused of conspiring to overthrow the government, which routinely leads to at least ten years in prison, were spared jail. The trial was conducted with unprecedented openness and regard for due process. All of this can be reversed on a whim, however, if there is no reform to the judiciary to ensure its independence. Mirziyoev is similarly keen to improve the country’s reputation for endemic corruption. Yet he has so far failed to establish mechanisms to prevent and punish it. The government has yet to learn its lesson from the recent scandal over bribes extorted by Karimov’s daughter from international telecom companies TeliaSonera and Vimpelcom. The tendering process in the country remains opaque, often non-existent. Public officials have no legal duty to file annual declarations that would be open to the public. There is no public database of companies and their owners. Regulating conflict of interest has not even been discussed. And there is no anti-corruption agency that should enjoy autonomy and independence from the executive. All this must change. If corrupt officials can continue to extort local and international businesses, in all likelihood they will. Instead, the government has invested in cosmetic change, by transforming a part of the capital into Tashkent City, a glittering complex of skyscrapers, to accommodate international businesses. To do so the city government has used the police, administrative pressure and intimidation, to evict hundreds of households, without consent or adequate compensation. Foreign investors would do well to consider how easily the rights of property holders can be rendered meaningless in Uzbekistan. The treatment of those families echoes how, under the Karimov regime, Newmont Mining Corp. and Oxus Gold were expelled from the country. It is true that some trade and administrative barriers for businesses are being lowered or removed, the tax system is being reviewed for reform, and the currency exchange policy has been liberalised. But as in Russia and Ukraine, embracing the free market will mean nothing for Uzbekistan’s ordinary citizens if there are insufficient safeguards against corruption and collusion between public office holders and private businesses. The result will be an economic and political environment dominated by oligarchs. Foreign investors are unlikely to be eager to operate in environments with such a high degree of risk. During his American visit, Mirziyoev signed 20 contracts for a total amount of $4.8 billion, which sounds like a great boost to the nation’s economy. Yet if you look at the small print, most of these are Uzbekistan committing to invest in the US economy, creating 10,000 jobs for Americans, not for Uzbeks. My country is at a crossroads. If it does not reform its governance system to better protect against corruption, it will become mired in crony capitalism, with all the consequences that entails – underdevelopment, new forms of authoritarianism, repression and inevitable mass discontent. The White House must keep on pushing Tashkent for institutional change if it doesn’t want another Andijan on its conscience.